Another peculiar release from the Hau-Ruk stable. 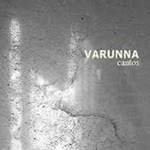 Italian trio Varunna start up with loose guitars in fine neo-folk fashion that flow nicely from the off, only to be interrupted with the annoying addition of a horn-come-bagpipe that really does grate on your nerves. Sadly, things degrade further as the disc goes along. The vocal style does nothing for the music, bordering on the inane and far too linear with nothing raising the ball. Only the odd addition of whistles and harmonica’s give this any real substance. Credit where credit is due, they don’t follow the same path as artists such as Death In June (which I half expected as every man and his dog copy them) and have the occasional surprise with ‘Noi Senza Voi’ which incorporates an almost post punk and dare I say it, ‘surf’ mentality to its structure. Either way, this is a unchallenging release, that doesn’t really do it for me. I am sure there are some out there who will love this, particularly if you are into Novy Svet and the like, I would imagine.